We’d love your help. Let us know what’s wrong with this preview of Understanding Cemetery Symbols by Tui Snider. To ask other readers questions about Understanding Cemetery Symbols, please sign up. Recommends it for: anyone who wishes to understand cemetery symbols. This is an invaluable guide to writers and researchers as well as amateur taphophiles (okay, I admit, I had to look that word up). The chapters such as "Why Symbols Matter," "Cemetery Safety and Etiquette," and "Cemetery Architecture" are well organized so if you have a particular interest or question, you can easily flip to the page and find the needed information. One aspect I found interesting in this book was the way symbols change over time and wane in popularity. Also, the same symbol can a This is an invaluable guide to writers and researchers as well as amateur taphophiles (okay, I admit, I had to look that word up). The chapters such as "Why Symbols Matter," "Cemetery Safety and Etiquette," and "Cemetery Architecture" are well organized so if you have a particular interest or question, you can easily flip to the page and find the needed information. One aspect I found interesting in this book was the way symbols change over time and wane in popularity. Also, the same symbol can assume altered significance depending on its depiction, culture, or religion. For instance, the book--always of interest to the writer in me--on a gravestone carries several different meanings. A closed book means the deceased lived a long life (as in long enough to finish the last page). Conversely, an open book means the person's life was cut short. And an open book with a draped cloth over it "represents the veil of death cutting a life short before the final page of the deceased person's life was written" (181). When I was given the opportunity to review this book, I didn’t merely sign up for it, I begged for the chance. Partly, of course, it’s because a lot of my writing lately is focusing on ghosts, but also it’s because the subject fascinates me. Maybe it’s because we don’t bury our dead in my family – we have them cremated and scatter the ashes somewhere meaningful – or maybe I’ve just read too many gothic novels with confrontations in family crypts, but graveyards have always intrigued me. In fact, When I was given the opportunity to review this book, I didn’t merely sign up for it, I begged for the chance. Partly, of course, it’s because a lot of my writing lately is focusing on ghosts, but also it’s because the subject fascinates me. Maybe it’s because we don’t bury our dead in my family – we have them cremated and scatter the ashes somewhere meaningful – or maybe I’ve just read too many gothic novels with confrontations in family crypts, but graveyards have always intrigued me. In fact, one of the only things I remember from a clever gardening book I read several years ago, is that graveyard roses are the hardiest plants if you want to grow roses from a cutting. "Simply put, symbols are the perfect example of the old cliche that ‘a picture is worth a thousand words’." What I really enjoyed about Understanding Cemetery Symbols is the conversational writing style. Ms. Snider’s writing made me feel like we were sitting on a front porch with a lemonade, looking over a historical cemetery, discussing symbols and history. Christians co-opted a lot pagan symbols. What is the difference in the meaning between cemetery and graveyard? Why do headstones face east? When a married couple is buried together, why are men generally buried on the left while women on the right? Hands of Cohen is an actual Jewish symbol, not just Spock’s Live Long and Prosper signature move. I’m not going to spoil the book for you. Check it out yourself to learn the answers! I do want to point out that there are some editing errors in the book. As much as I loved the photos, they didn’t always line up with the text. Maybe this is an issue with the printed version? There were also some typos throughout the text. Not enough to be an issue for me, but enough that I did notice them. I’m sure you might be thinking that a discussion of cemetery symbols would be completely morbid. But for me, it was not in the least bit. This guidebook will be a helpful tool while roaming cemeteries or planning a future gravestone. Also, and most importantly, there are no weeping angels to completely freak me out! A winter solstice gift from my husband after we spent the summer before exploring local graveyards. This book a solid companion when exploring graveyards, particularly in the United States. I was raised Presbyterian, and because of my background, I was not intimate with the symbols associated with saints, angels, and the like. I also learned quite a great deal about fraternities and other "secret societies" and their place in American history. A large number of which offered funeral and other fin A winter solstice gift from my husband after we spent the summer before exploring local graveyards. This book a solid companion when exploring graveyards, particularly in the United States. I was raised Presbyterian, and because of my background, I was not intimate with the symbols associated with saints, angels, and the like. I also learned quite a great deal about fraternities and other "secret societies" and their place in American history. A large number of which offered funeral and other financial security after the death of a member. The reasons I decided to give this book a three-star rating rather than four are twofold. The greater of the two is the layout of the book itself. The chapters and their contents were organized well, but the formatting often lead to images being two or three pages ahead or past their written counterpart. I would also lose my place on a page quite often. The lesser of the two complaints regarded spelling errors, most of which appeared in later chapters. I'm not sure if this was a case of not having an editor or they were simply overlooked. If you enjoy visiting old graveyards as a hobby or pastime this is definitely the book for you. I can also see it being useful for those interested in history or those who like to do genealogical research by visiting graveyards. Very easy to access for all readers, and can easily be brought along as a field guide when at the graveyard. The only reason I chose to give it four stars instead of five, I felt like it needed more pictures. Often I had to stop reading to look up what t Very Informative! 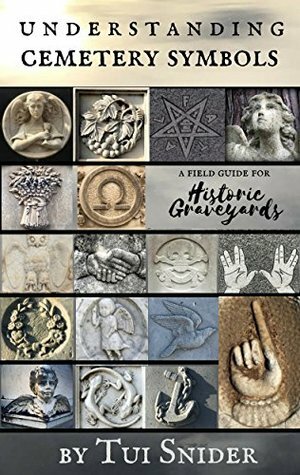 This book is a valuable guide for anyone interested in old cemeteries, their histories and the "decoding" of various symbols found on gravestones. The author points out the need to interpret symbols in context and not to go into cemeteries alone, the latter a valuable piece of advice I have not seen in similar books. Although the content is tilted towards American cemeteries, most of the information is applicable to Canada as well. If you’re a genealogist or a geocacher or just like cemeteries, you should get this book. Quick way to find a quick explanation for symbols you might see in cemeteries. Recommended! Straightforward, the way she writes is easy and fun to read. It goes alphabetically and properly organized. I enjoyed it enormously! I learned quite a lot while reading this book! It is very educational with regard to cemetery symbolism. Thanks so much! The information presented in organized in an easy to follow fashion. I found it very useful. I do visit old cemeteries and have often wondered about the not so obvious symbols on headstones. Interesting treatise on graveyard symbology, but was very hard to read because you couldn't increase the point size of the type. It would actually zoom in and cut off text. I didn't notice until I got to a page turn where the text didn't make sense. I had to zoomback out to a point size that was difficult to read. Also, more photos would've helped. An interesting book for all of the taphophiles among us. Always wondered about the origin of the things seen in old cemeteries. Fun concise information. If you ever visit a cemetery for any reason, this would be an excellent companion. I spend a lot of time in cemeteries. This is very helpful to have in hand when I am wondering what something means. I enjoyed reading this book.It offered a unique approach to understanding cemetery symbols. I'm sure with the millennial generation emoji will be used as well in the years to come.